Each person has seen the struggles thrown by life on them. But only a few are able to make out from it, while others are crushed under it. Today, we tell about such an achiever named Elizabeth Marks. At the age of 17, she joined the US Army. In 2010, an accident changed her entire life. 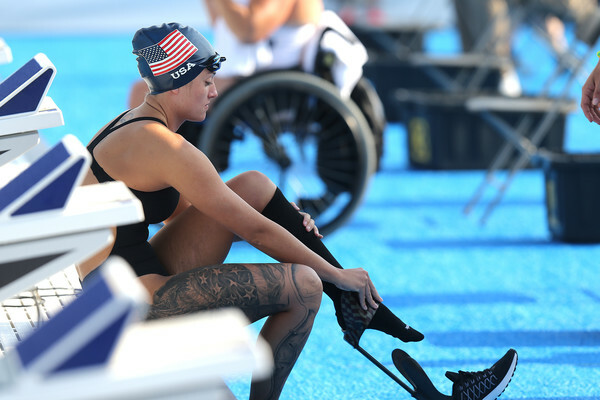 As a former soldier in Iraq; In her posting, she suffered multiple devastating injuries to her hip, which made her left leg no longer functional. Despite the injury, she didn’t stop her service to the US Army. She underwent three surgeries that restructured her hips . She achieved enough mobility to walk because of the surgeries in 18 months. In 2012, she for the first time got into the pool with the goal of getting some extra physical therapy and cardio. Marks states that I am very slow, and it’s so hard, and [Hansen] just yell and cheer the whole time, and that extremely encouraging and humbling for me. She fell in love with swimming at the swim meet. She experienced a painful time when she tried to morph her swimming style for an upper body stroke. Her injuries on the legs are covered by a tattoo and she ink it right on her scars. The process of tattooing on the injuries is more gruesome than on the normal flesh. Elizabeth says that her scars signify rough-earned symbols. She sees the scars as the means to help others to believe that they can survive their own scars. Elizabeth is such an inspiration to us all. She gives hopes to every person who is struggling or hurt.